"Or they have to be a sub-species, or for vertebrates, they can be a distinct population segment," said Emily Latch, associate professor of biological sciences at UWM. "It's important to delineate taxonomic groups appropriately, because taxonomic classifications have important implications for conservation efforts and ESA protection." 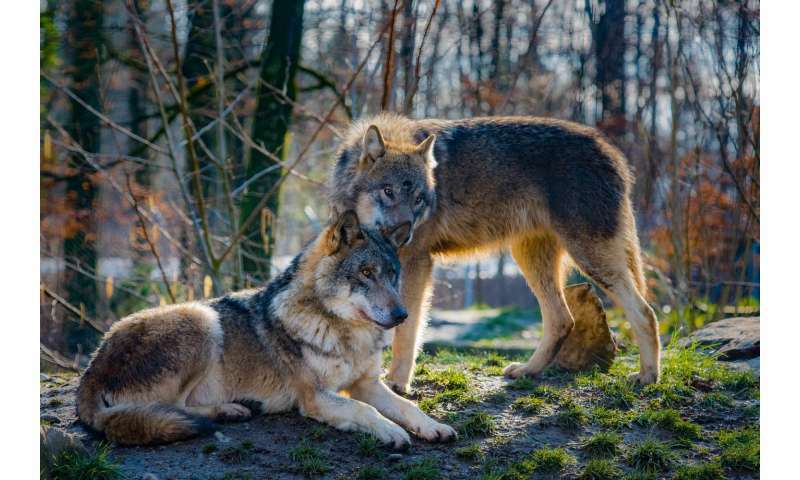 That means there could be high stakes for red wolves and Mexican gray wolves as the U.S. Fish and Wildlife Service conducts an assessment on the taxonomic status of each breed. Taxonomy refers to an animal's classification – its genus, species, etc. "We've presented information at a series of meetings and webinars. The webinars have been on topics like, 'What constitutes a species or a sub-species?'" Latch said. "I talked about how hybridization occurs, how hybrids are maintained and what approaches we might use to evaluate hybridization in species in the wild. Those are the sorts of things my lab does. We use genetic tools to help understand how animals use landscapes and how changes to those landscapes affect evolution." Most people are already familiar with hybridization, if only because they've seen purebred dogs versus mutts – hybrids between two or more breeds. "But they're all one species: dogs," Latch said. "One of the purest definitions of a species is that they're two things that don't interbreed. So once they start to interbreed, it becomes challenging to determine what is a species." She's talking specifically about red wolves. Today, red wolves can be found only in a recovery area in eastern North Carolina. Red wolves frequently interbreed with coyotes and produce hybrid pups. Sometimes, hybrid offspring are sterile and cannot produce babies of its own, such as mules, hybrids between horses and donkeys. But red wolf/coyote hybrids are fertile, challenging managers to keep the populations from mixing and to remove hybrid pups from the wild. With only about 30 red wolves left in the wild, Latch said, it's an ongoing struggle. The future of conservation efforts for both breeds is uncertain as the government debates their taxonomic status. Latch isn't sure of her own opinion either – the fact that red wolves can hybridize with coyotes makes determining a designation tricky, and the evolutionary history of wolves is complex – but she's enjoyed learning from her colleagues around the country as she's listened to their webinars. "I was honored to be able to help the National Academies with this difficult charge, and happy to apply my lab's work and experience to a new and important conservation problem," Latch said. The committee's report will be released in March. You can learn more about the taxonomic debate at the National Academies of Sciences, Engineering and Medicine website, and you can view Latch's presentation on the academies' wolf taxonomy webpage, starting at 29:20.